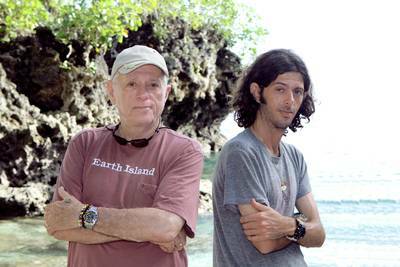 You might recognize the name Ric O'Barry from the Academy Award-winning documentary The Cove. Now, Ric and his son Lincoln (pictured left), are continuing the journey they began with The Cove. Animal Planet will premiere Blood Dolphins, a three-part series that goes deep within the world of dolphin trade and slaughter TONIGHT at 11 p.m. ET/PT (at a special time following the two-hour Whale Wars finale). Then, Animal Planet follows Blood Dolphins with basic cable premiere of Academy Award-winning film The Cove on Sunday, August 29, at 9 PM ET/PT. Blood Dolphins takes Ric and Lincoln further on their mission to expose to the world the atrocities of dolphin slaughter in Taiji, Japan (also known as the "Cove"), and confront dolphin trade activity and repercussions of trade and captivity in the Solomon Islands. I had the great honor of speaking with Ric about this very important cause, and believe me, he has quite a lot of important information to give about it. Celebrity Extra: I know that when you do your work you put yourself, and now your son, because he’s working with you, in great peril. Have you ever considered quitting or does that only add fuel to the fire of wanting to help the animals? Ric O’Barry: I really don’t think too much about. What we have to do is right in front of us, and we just do it without thinking too much. CE: I remember when you were talking about how one of the dolphins, I believe it was Cassie, basically committed suicide and died in your arms. Was that the turning point for you in wanting to help free the captive dolphins? RO: Yeah, that was the turning point or the tipping point I should say. Leading up to that for a few years I was really turned off by the captivity of dolphins. But I didn’t do anything about it until that happened. That was Earth Day 1970 — the first Earth Day. CE: I know everyone who saw The Cove has been affected by it, and now this has lead to the new show on Animal Planet, Blood Dolphins. How has the public’s knowledge and outrage of this helped further your cause? RO: I can’t really — I don’t hold my finger on the pulse of that, how many people have seen it. But I feel when people see it, or see the TV series, they’re going to think twice before they buy a ticket for a dolphin show. That is the key to solving the problem — the consumers. I don’t know how many people have seen it in theaters. I don’t pay too much attention to that, but the bigger audiences are on television and that is going to happen next month. That is very exciting to me. CE: Now that you and your son went back to Japan, you saw that the slaughter is still happening, what was your reaction on discovering this? RO: We were there several times since the film has been released. Last September 1st we were there together. Lincoln did a show around then. That’s the day the dolphin slaughter begins, September 1st and goes through March. Things changed in that during that period, September 1st of last year, the town of Taiji, the mayor and the city council implemented a no-kill policy. In other words, they were bringing dolphins in and they were capturing them for the dolphin swim program, the dolphin captivity industry. But they let about 300 of them go. They still kill pilot whales, or they did after we left, but they stopped killing bottle-nosed dolphins probably thinking, “That will appease them. If we let the bottle-nosed dolphins go, they’ll be all right with it." So, we don’t know what’s going to happen this September 1st. It’s coming soon. The clock is ticking and when it strikes midnight September 1st, and that is when it all begins all over again. We are hoping for major change because of The Cove and the television series Blood Dolphins. They know about it. The Japanese government reads, they know what’s happening. I think we have a chance to stop it — we’ll see. 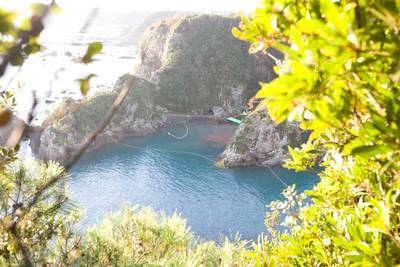 CE: I know, too, that there had been a battle in Japan about whether they would allow people to see The Cove over there. Do you think it could make a difference if the Japanese were allowed to see this film and see what is happening in their country on their own land? RO: Absolutely. There are 126 million people in Japan. That’s a lot of people in that country the size of California. And they have 50 dolphinariums in that small space. The key to it is getting it in front of the Japanese people. I just got off of a train [prior to calling you]. I was in Denmark and I just arrived in Hamburg, Germany. I got an e-mail telling me that a Yomirui newspaper, the largest newspaper in Japan, reports that The Cove movie is a surprising success. It’s in theaters now in Tokyo, Osaka and major cities, and apparently it’s doing well. The weekends are packed. That’s very exciting to me. The Japanese people are more concerned about clean, healthy food than we are in the West. If they had any idea, regarding the mercury issue, they simply wouldn’t buy the product. Getting it out in Japan was the only important thing to me. I’m not that concerned with getting it out in America and Europe and anywhere else; it’s all about Japan. CE: Not only do you face opposition in Japan, but in Blood Dolphins you also explore the trade that is happening in the Solomon Islands. Can you tell me a little about what you encountered when you and Lincoln were in the Solomon Islands? RO: It was very exciting. April 8th they agreed to stop killing dolphins after 400 years. They kill as many there as they do in Taiji, and I didn’t know that. I thought it was a small number but actually it’s about 2,000 a year ,and they’ve stopped. There are two episodes of Blood Dolphins about that, how it came about. CE: Wow, that is excellent. Now, you’ve longed worked also to encourage the big U.S. parks, the Sea Worlds, Marine Lands and all of that to speak out on the wild dolphin trade. Has the public’s reaction to The Cove had any effect on that or are you hopeful that maybe Blood Diamonds — oops! I mean Blood Dolphins — will also help further the cause? RO: Well, you made the connection. That's great! I wondered if people were going to make that connection. That’s a good sign. I hope everybody else does that. No, the captivity industry, this is a multibillion dollar industry. Two billion dollars a year in profit in the U.S. alone, and that industry has the power to not only stop the dolphin slaughter, but to stop the captures, but they don’t do it. They don’t get involved. They just have a politically correct policy but no action. So, I’m not happy with that industry. They could shut this down but they don’t do anything about it. Especially the World Association of Zoos and Aquariums (WAZA). They could get the dolphin trainers out of Taiji and shut down the captures, which would shut down the dolphin slaughter, because it’s the captures that are the economic underpinning to the slaughter. CE: I was also glad when you spoke out about the incident that occurred right here in Orlando at Sea World, where the killer whale had killed its trainer. That’s a prime example of man trying to tame beast for their own amusement. What did you think when you heard the news that that had happened? RO: I wasn’t surprised. It happens a lot. You just don’t hear about it because they cover it up. There are lawsuits and those lawsuits are settled out of court. Trainers have been hurt in the past at Sea World and other places, and also in the dolphin swim programs around the world. But the lawsuit is filled and they have a gag order; people are paid and nobody knows about it, especially if it happens in a training area. This happened in front of an audience when people had video cameras, so it’s really hard to cover that up. But a few weeks earlier, another Sea World killer whale killed a trainer in the Canary Islands and nobody heard about that. CE: No, no this is the first I’ve heard. RO: It doesn’t work. It’s a failed experiment. Keeping dolphins and other whales in a concrete box doesn’t work. It never worked. That’s why I left the industry. CE: I know that you give advice on how ordinary folks can help your cause. Here in Florida, specifically, we have a lot of people who are especially interested in ocean conservation issues. I was wondering how you would suggest they get involved to help stop the dolphin slaughter and the trading of wild dolphins? RO: One of the things — it sounds very simplistic — but the most important thing is: Don’t buy a ticket for a dolphin show. Also, a lot of people buy tickets for dolphin swim programs. The real power is with the consumers. That’s one thing they can do. As far as Japan is concerned they can go to our website savejapandolphins.org and support the campaign to stop this world’s largest dolphin slaughter. CE: Anything that I didn’t touch on about the new show that you wanted to discuss? RO: No, I just hope people will watch it. It’s the new activism. This is the activism of the future. The way I did it for the past 40 years was the hard way. My son, Lincoln, who is the executive producer and director of this series, he’s doing it the right way. He’s reaching more people in an hour than I would be able to reach in years.